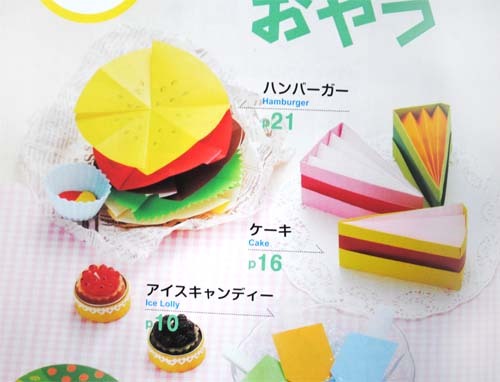 I purchased this origami food book at Daiso a while back thinking it would be fun for a giveaway. I liked that it was a little different from the traditional origami books I normally see. The book features both American and Japanese food with directions in English. On to the Giveaway. . .one lucky reader will win Origami of Delicious Food. To enter, please share a food you would like to see as origami. One entry per household. Please leave an email address so I can contact you if you win. The last day to enter the contest is Sunday, June 24 2011. I'll announce the winner Monday, June 25 2012 on this post. If I do not hear back from the winner after two weeks, I will choose a new winner. Open to everyone. Congratulations to Sarah who said she would like to see a meatloaf origami with all the trimmings! Thank you to everyone who entered, I enjoyed reading all you creative origami food ideas. a slice of matcha-cake would be so great! I would like a whole roasted chicken, just because i think it'd be funny! thanks for the cute giveaway! A set of chicken nuggets, in the box. A cupcake would be perfect!!! I would love to see cupcakes - especially with the ability to lift the top off so you could hide little surprises inside! What a great reminder to make a trip to Daiso!! I would love to see sushi origami :). OK -- I'll like to see......Peanut Butter! a lamb crown roast with the little foil caps on top. I would love to see origami cupcakes too. Lots of the ideas sound like fun though! I´d love to see a cupcake! I'd love to see a salad with leafy greens and lots of other stuff in different colours. The cake is so cute, my granddaughter is a huge oragami fan and I would love to win this book for her. Hmm, maybe I'd like to see a whole basket of fruets and veggies! And an origami hamburger or taco would also be great! And I'm happy to get a chance to win. Thank you! I don't know if it's possible, but a donut origami would be grand! I would love to see a slice of raspberry cheesecake. Thanks for a chance to win! Oh I love it!!!! 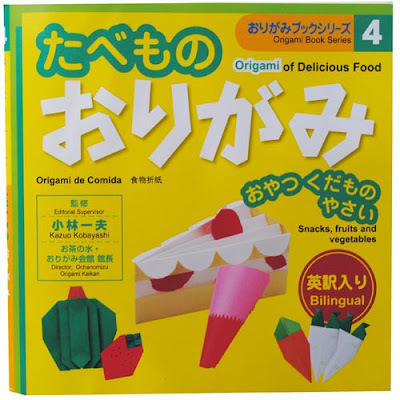 I always like to fold the food on the origami-club page, this book looks so cute! I´d love to see a peperoni pizza as origami. I would love to see a banana origami. That would be cute! 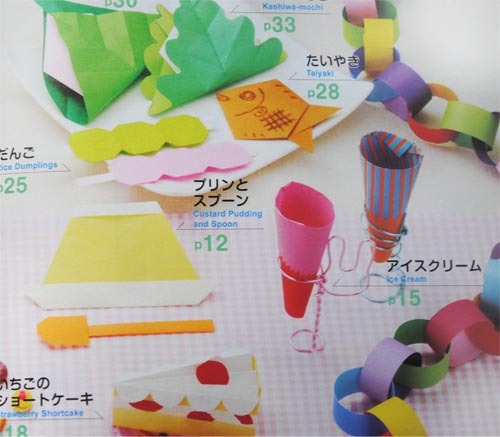 I scream for ice cream (origami, that is)! Thanks for giveaway. I'd love to see a bag full of origami popcorn! How about a croissant? Plan or chocolate is fine with me. Yummy! I'd like to see onigiri! Macarons or sushi would be really cool! Pasta would be fun I think. A peanut, in the shell. The book looks really cool. I love origami! I would love to make an origami cupcake! Great giveaway! I would love to see/make a roast pig!